Jeff Sessions speech at Heritage Foundation: Calls on the right for immigration showdown grow louder. Sens. 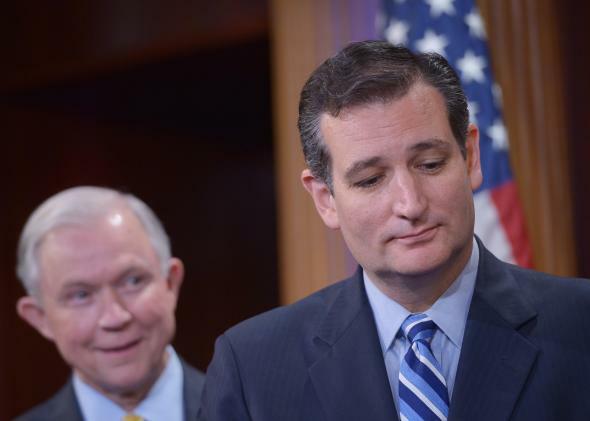 Ted Cruz (right) and Jeff Sessions. After the president’s immigration speech on Thursday night, there was a rare moment of near-total Republican consensus. That consensus was this: Regardless of any merit to the substance of the president’s executive action on immigration, the move itself represented a radical executive overreach and a threat to our constitutional system of separation of powers. This Republican unity is genuinely impressive, considering recent history, and important for their hopes of fighting the action. But it may not last. In a speech on Friday morning at the Heritage Foundation, Sen. Jeff Sessions—perhaps the single most influential voice pushing back against the president’s moves on immigration—laid out conservatives’ reasons for the opposition and gave a prelude of the coming fight within the party, and then maybe with the administration. Obama has undermined “the moral integrity of immigration law,” Sessions argued, as well as the separation of powers. He also made a populist case, arguing that an influx of low-skilled immigrants (whether they enter the country legally or illegally) would drive down already stagnant wages. The Alabama Republican also argued that the strongest supporters of comprehensive immigration reform, including tech billionaires like Mark Zuckerberg, back it because they expect it to buoy their own personal fortunes rather than the fortunes of the working class. The senator also highlighted Republicans’ unified opposition to the president’s executive action, citing RNC Chair Reince Priebus’ promise that Republicans will do everything they can to stop it. When an audience member asked for more specifics, Sessions cited Democratic Sen. Carl Levin saying it wouldn’t be a break from the norm for Republicans to use the appropriations process to block the move. “That’s not uncommon that there’s amendments saying ‘none of the funds in this appropriation bill may be spent for’—fill in the blank,” Levin told National Review. Sessions said he and Levin concur on that point. “Congress should use its power that way,” Sessions added. Heritage Action spokesman Dan Holler agreed. Here is where Republicans will start to disagree with each other. For Sessions, Heritage Action, and other opponents of the president’s immigration move, there’s only one acceptable outcome: stopping it from happening. The question is how to do that. Republicans have proposed a variety of responses. Sen. Ted Cruz wrote a Politico magazine op-ed saying Republicans should refuse to confirm the president’s nominees as long as the action is in place, and Speaker John Boehner is considering suing the White House over the move. Rep. Hal Rogers, the Kentucky Republican who chairs the House Appropriations Committee, has said that using the appropriations process to stop the president wouldn’t work. His spokeswoman, Jennifer Hing, was emphatic on that point. Levin’s comments undergird Davis’ point. And Cruz endorsed that strategy on Fox News. In the coming weeks, this will probably be the central bone of contention among Capitol Hill Republicans: Assuming Levin is right and Rogers is wrong about what Congress can do, should Republicans refuse to appropriate funds for the president’s move? Opponents on the right and left will argue that doing so could precipitate a government shutdown, as the president would probably veto any appropriations bill with a rider attempting to block his executive action. But supporters of that strategy make two key points: First, they cite Levin, arguing that because Congress has the power of the purse, it has the right to block presidential moves such as this one. Second, they argue that any shutdown would be the president’s fault, not theirs, as it would be the result of his refusal to sign a spending bill to keep the government open. Republicans blamed the president for the 2013 partial government shutdown, but a Wall Street Journal poll during the shutdown showed that respondents blamed Republicans over Obama by a 22-point margin. But their strong showing in the midterm election has some arguing that a similar scenario might not have detrimental electoral consequences. Sessions’ stance on blocking the president’s executive action means House Republican leadership will have to weigh their next move carefully.